Effective relief from muscular & rheumatic aches, pains & stiffness. Pain relief plus heat. Rub on relief.Recommended for the relief of muscular pains and stiffness including rheumatic pain, back pain, sciatica, fibrositis, sprains, bruises and chilblains. Can be used before or after exercise. Dual Action - Targeted, warming relief at site of pain Pain Relief Deep Heat Heat Rub contains the aspirin-like drug methyl salicylate for targeted pain relief. 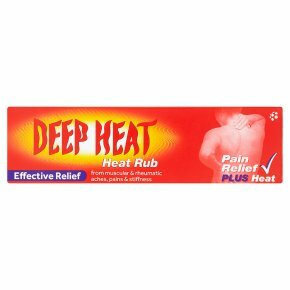 Heat Deep Heat Rub contains warming ingredients that increase blood flow and provide soothing pain relief. Pierce tube with point in top of cap. Directions for use: Use this medicine only on your skin. Adults and children over 5 years should gently massage Deep Heat Heat Rub into the affected area until the cream is rubbed in. Apply a thin layer to the skin 2 - 3 times daily and wash hands immediately after use. Can also be used before or after exercise. Caution: Please read the enclosed leaflet for warnings and precautions for use. Do not use if you are allergic to any of the ingredients or painkillers such as aspirin, ibuprofen and other NSAIDs. Not to be used in children under 5 years. Consult your doctor before use if you are pregnant, breast feeding, asthmatic or on any prescribed medicines.<br>Keep all medicines out of the sight and reach of children.